Forget expensive Maldives trips that will cost you your entirely month's salary (if not more) and dispel any ideas of faraway shores for your private romantic getaway. We've got everything you need, right here in South-east Asia. If you're craving some R+R and have always seen those private pool villas on the 'gram but assumed you'd need to be filthy rich to afford it - think again. There are so many beautiful places close to our shores that deliver the breather you desperately need, whether for a mini weekend away or for a couple of weeks. Check out our top eight recommendations for the private-pool holiday experience that will make all of your social media followers darn envious they're not with you. Nestled on the cliff-top coast of Jimbaran Bay, a mere 20-minutes drive from the airport, AYANA Resort and Spa Bali is a 90-hectare integrated 5-star resort that has won multiple awards. Basically, you know you're in good hands. The resort has various options of accommodation ranging from standard rooms to suites and private villas. These villas, with either one or two bedrooms, provide you with the most incredible luxury. Built purposefully to offer you cliff-top views for your sunrise and sunset snaps, the villas have their own secluded garden with a private pool. You receive your own 24-hour service butler, as well as options like a floating champagne brunch in your own pool, private romantic candle-lit dinner and various spa treatments. Whether it's a honeymoon, mini-moon or just a weekend break, these villas are absolutely worth the price tag. As for the resort itself, you've got so much to see, taste and explore. A real charm is their 'Rock Bar' that is, literally, built on the edge of the cliff face 14 metres above the ocean. The sunset views served along with iconic cocktails will make for a wonderful experience. There are plenty of dining experiences to be had, from a private table surrounded by water on the pontoon at a pond to dining in a pavilion surrounded by terraced lotus ponds reminiscent of rice fields to privately dining in a private cave-style cabana. But if you love seafood, their Kisik Pier dining experience is just divine. Enjoy a four-course meal eating underneath the stars at the end of the pier, while surrounded by tiki torches. Talk about the very best in oceanfront dining! What's really awesome about this hotel, is that it connects to another hotel RIMBA Jimbaran Bali and is thus the island's only integrated resort. This integration means you have complimentary access to over 19 restaurants and bars, 12 swimming pools and of course, a private beach. AYANA Bali even has a shopping arcade complete with 12 boutiques, so you don't need to leave the resort to fulfil your retail therapy needs. That being said, if you want to explore the Balinese traditional culture, the resort is just five minutes to Jimbaran Village's art galleries, boutiques, traditional market and fish market. Prices for private pool villas start at S$731 per night (March 2019 weekday rates). A short 20-minute drive into the Balinese cultural hotspot Ubud, Furama Villas and Spa is nestled on a hill surrounded by beautiful rice fields. A real retreat for those wanting silence and relaxation, it's a spot that is still close enough to venture out for food, drinks or culture at the local arts and crafts street markets. With just 24 villas - 19 deluxe pool villas and five royal pool villas - everyone is treated like a VIP, with their own villa area that includes an outdoor pool, sunlounger beds, wooden canopy (as shown above) and a patio with an outdoor dining area. Surrounded by luscious green plants and boasting a scenic garden, it's truly your own little tranquil space. Inside the villa is a huge four-poster bed in the living area, which then leads into a separate bathroom with a massive stone bathtub. There's also an outdoor shower area too - because no-one can see in, so why not? With breakfast included and served at the main reception every morning, you can relax in their reading area or head to the large communal pool with poolside bar, if you desire external company. Or just laze your days away in the privacy of your own luxury villa. You can also order a special romantic dinner for two, which is prepared and served inside your villa, accompanied by candles and petals laid across the ground. What's more, you'd receive personal entertainment in the form of a traditional Balinese musician, who will play for you as you enjoy the meal. You'd think this all comes with a heavy price tag, but it's actually super affordable. Just compare websites or third party travel websites, and you'd find some incredible deals for one of these villas. Truly a fantastic find. 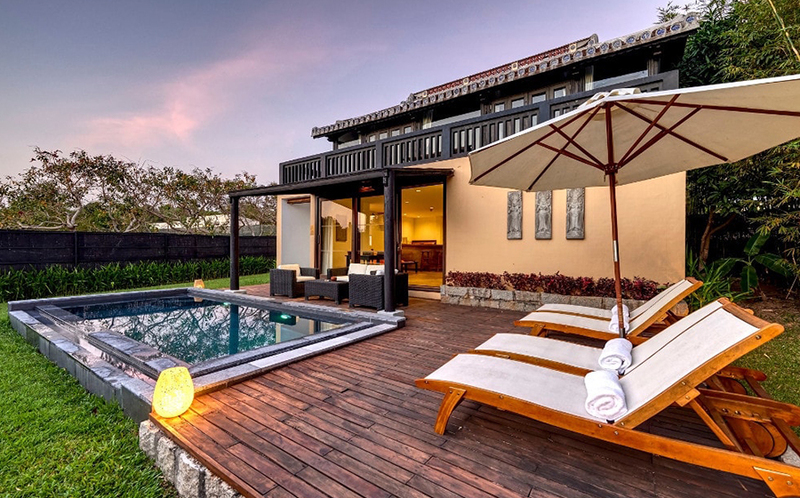 Prices for private pool villas start at S$191 per night (March 2019 weekday rates). A popular location in Cambodia, Siem Reap is home to many awesome getaway venues. 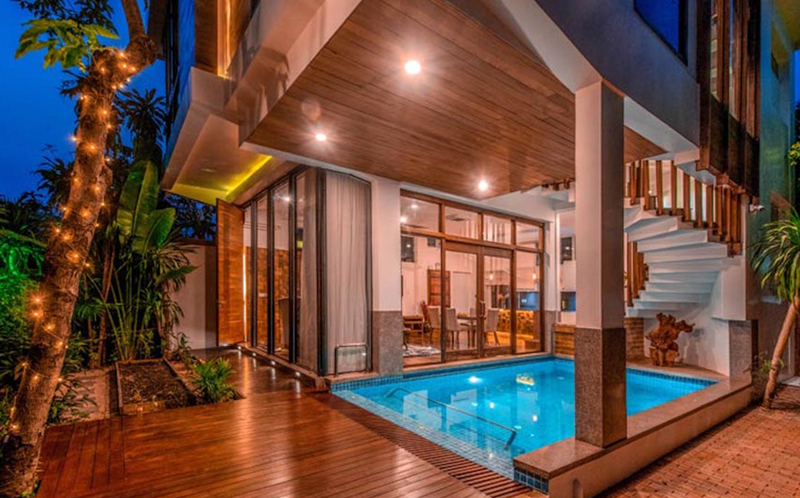 This luxury villa, in the downtown area of Siem Reap, is a great option for those travelling with friends or family. It has an epic three floors housing two bedrooms, each with a queen bed. It also has a garden, roof terrace and its own private salt water pool. It even has three bathrooms, all sporting a luxe rain shower, and a spacious wooden floor living room, dining area and a fully equipped kitchen. If you fancy a cool BBQ dinner, just head up to your own roof terrace and crack on. You can take in the picturesque sunrises and sunsets from this rooftop too. If you want the entire villa just for the two of you, no judgment - it's your vacation after all. It is a full-service villa, meaning you can reserve a honeymoon package for your stay here, not to mention a butler service and a personal chauffeur. You can even reserve a private chef to cook you tasty delights in the kitchen. How glorious. Prices for villa start at S$249 per night (March 2019 weekday rates). Minimum three-night stay. Address: Chocolate Road, Siem Reap. 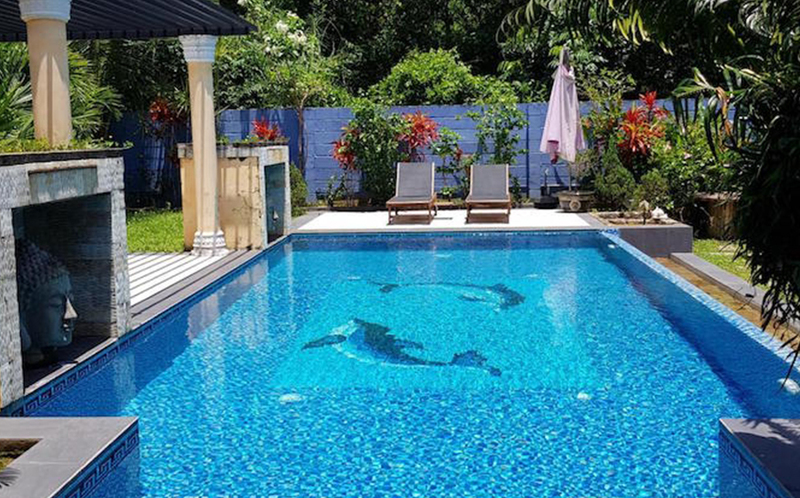 Set in the Svay Dangkum area of Siem Reap, this villa has its own large private garden with a beautiful long swimming pool for you to enjoy, surrounded by palm trees. The villa is very modern and open, and is distinctly different from the more traditional wooden villas you often find in South-east Asia. That being said, the interior decor is predominantly wood, a nice nod towards the local heritage. With a huge bed that faces a glass wall, you can look out directly into your own private outdoor area, without leaving your bed. Next door you'll find a deep bathtub and separate shower, whilst on the other side you'll find the open plan kitchen and dining area. It's bright and airy and has various awesome additions, including breakfast, free airport transfers (only 6km away from Siem Reap airport), shuttle services to city centre, daily housekeeping and free Wifi in all rooms. Can't be bothered to cook? There are restaurants, a coffee shop and a communal pool with a poolside bar too at the main hub of the resort. You'll want for nothing during your entire stay. Prices for villa start at US$200 per night (March 2019 weekday rates). Address: Neelka Way, Siem Reap. This new Six Senses luxury resort is only opening on March 1, 2019, meaning you can be one of the first few to stay here and enjoy its pristine facilities. Choose from their hideaway pool suite, ocean pool villa, ocean pool villa suite or the oceanfront pool villa suite. All come with their own private plunge pool and sun loungers, set in the stunning tropical surrounds. Boasting luxury at its finest, it's a 12-hectare private resort that has 40 villas with their own pools. Every villa has floor to ceiling glass walls which allows natural daylight to stream in, making you feel like the outside is inside. It also allows you to stargaze, minus the mosquito bites. If you don't mind being outdoors at dusk, why not dine alfresco on your own private sundeck? Every villa is one bedroom and comes with a large ensuite bathroom to while away your evenings soaking in a large bathtub. Slight variation to note: The ocean pool villa doesn't have an internal living space, whilst the other options do. As for the resort itself? Expect 5-star treatment, including the Six Senses luxury spa, sunset bar, two restaurants, ice cream parlour, horizon lap pool, outdoor fitness circuit, oceanfront boardwalk, beachfront sundeck, open-air cinema and sky observatory. A retreat fit for royalty. Prices for a villa start at S$1137 per night (March 2019 weekday rates). 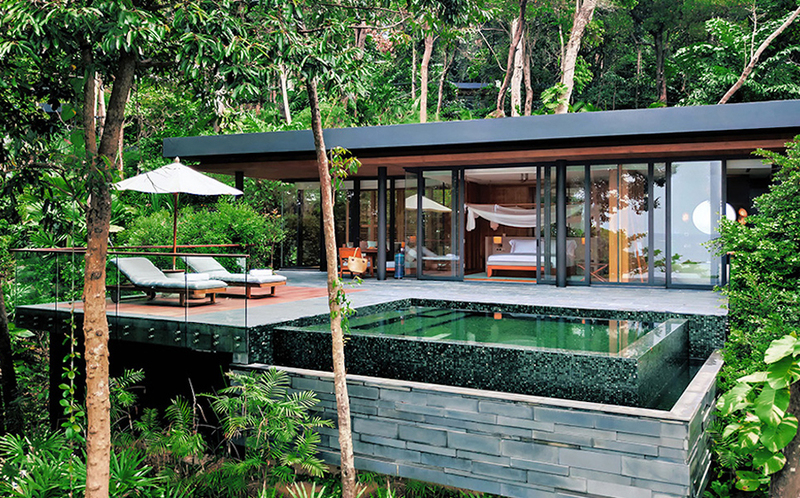 Nestled in the green and natural area of Nai Harn, this one bedroom villa with its own private plunge pool is an idyllic getaway for anyone wanting some 'me time'. With your own garden and a waterfall in the plunge pool, while away your days with total relaxation or head to the Rawai beach nearby for some local dining and sightseeing. With free breakfast, free Wi-fi, BBQ facilities and your own kitchenette, this place is a lovely and affordable getaway venue for those wanting something very easygoing. The best thing about it is the cost - it's the price of a standard hotel room per night here in Singapore, with the added bonus of your own garden and pool. For those wanting something last minute and not expensive, this is the choice for you. Prices for villa start at S$94.60 per night (March 2019 weekday rates). This private resort is found in Ong Lang beach among the tropical rainforest and boasts of its own sandy private beach. 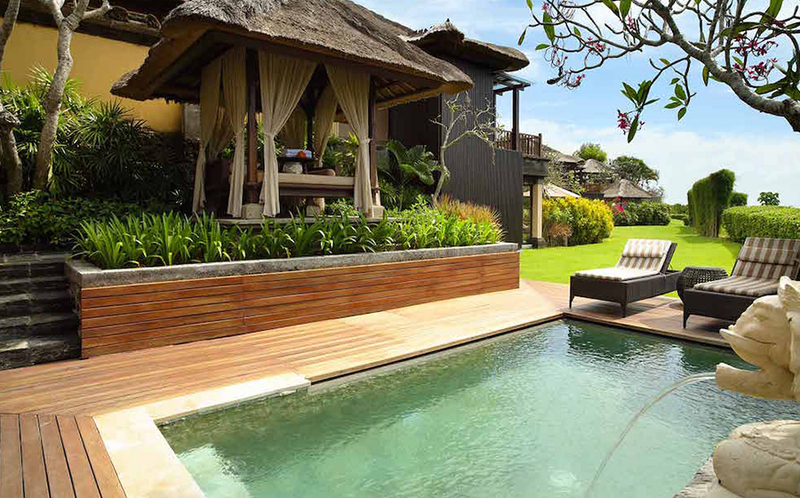 The resort hosts 36 villas in total, including standard villas, Jacuzzi villas and two bedroom pool villas. Whilst we agree a Jacuzzi isn't technically a pool, we still think it's worth a mention in our list, because of its luxury amenities and tranquil environment. The villas provide a large king size bedroom and an open air spacious bathroom featuring double basins, bath and rain shower. They also feature an outdoor living space and, of course, a Jacuzzi pool. A happy middle ground for those wanting somewhere to cool off but are not bothered about having a large pool to themselves. As for the pool villas, they have two separate bedrooms (two king sized beds) situated on separate floors. 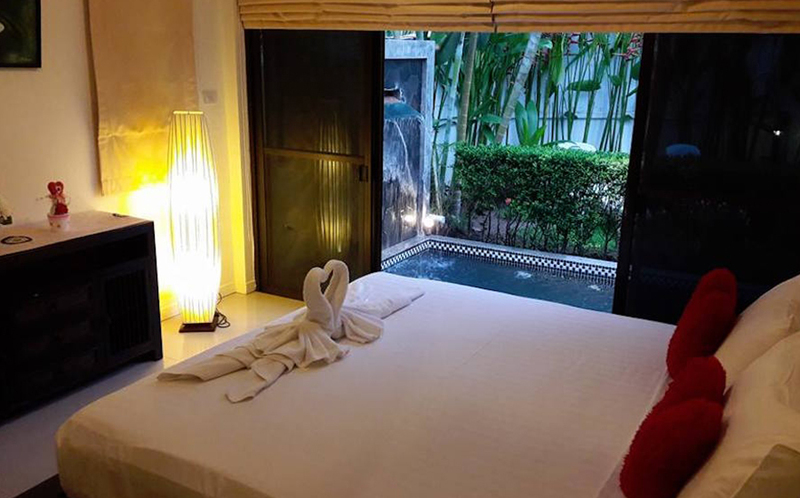 The master bedroom is on the upper floor with a king sized bed opening into an spacious bathroom with double basins, double rain shower and a bath complemented by a private terrace. On the first floor you will find a living room and the second bedroom. A fab idea if you and your best couple friends want to go away together. This villa has its own outdoor living area with a private infinity edge pool, complete with sun loungers of course. Oh, and lest we neglect to mention, both Jacuzzi and pool villas come with a wine cooler and Espresso machine. Two very important things for a great vacay, if we may say so ourselves. Prices for villa start at US$260 per night for a Jacuzzi villa, US$444 per night for a pool villa (March 2019 weekday rates). Address: Bai Xep-Ong Lang Hamlet, Cua Duong Village, Phu Quoc District, Kien Giang Province. With just four villas in the sprawling 2800 square metre complex, Lotus Private Pool Villas offer three one-bedroom villas and one huge four-bedroom villa that can sleep up to eight adults and four children. A great option if you have a large family or a group of friends who all want to go on a vacation together, but still feel the need for luxury and privacy. 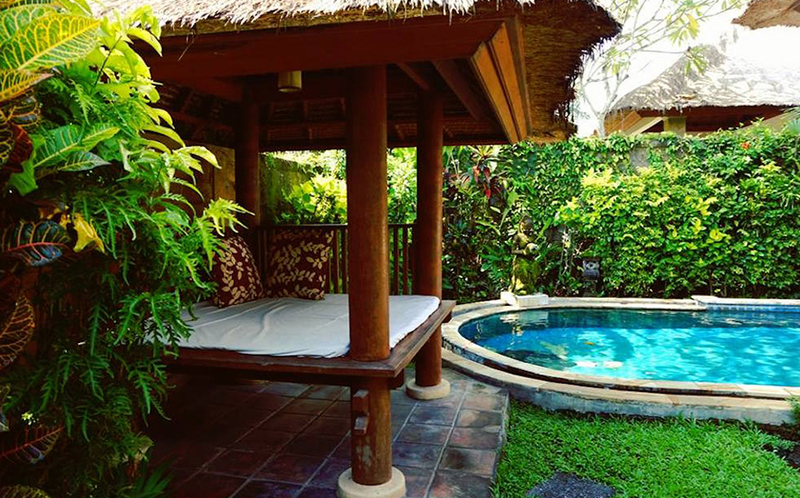 Speaking of privacy, each villa has its own private garden, private pool and Jacuzzi. In a glorious nod towards a more traditional living arrangement, the living room is also outdoors! Tastefully furnished with a cushioned bamboo lounge suite, a coffee table and a dining table for four, you can enjoy your breakfast watching the sun come up. You also have an open-plan kitchen equipped with a two-burner gas hob, a refrigerator and a microwave. 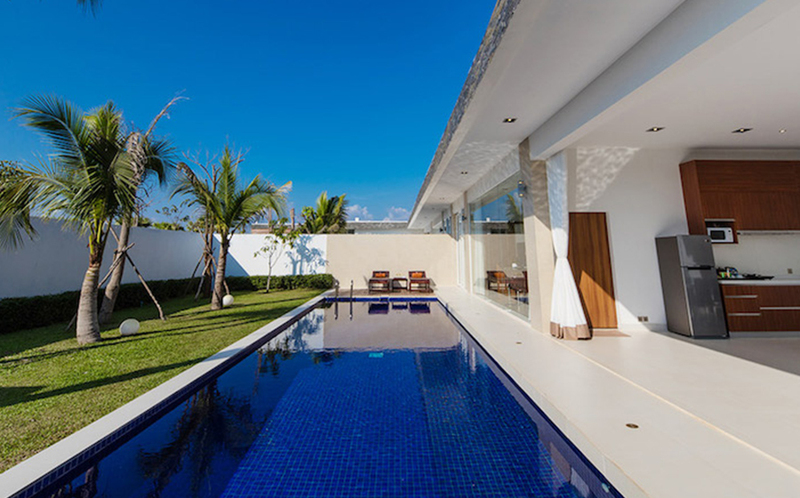 As for the area itself, these villas are conveniently located on the coast of Ong Lang, a short 25 minutes from the international airport, 10 minutes from Duong Dong town centre and just 5 minutes from the beaches. So if your private pool doesn't float your boat, head to the beach for the day instead. Prices for villa start at S$189.55 per night (March 2019 weekday rates). Address: Group 4, ap Ganh Gio, xa Cua Duong, Duong Dong, Bung Goi, Kiến Giang, Ong Lang, Phu Quoc.